You have a Future....We have a Plan! Whether you are 20, 25, 30, 35, it’s never too early to start thinking about your retirement. The earlier you start saving the better off you will be. Start building now for your golden years with an MRA and help fill the gap left by Social Security and pensions. Interest is paid annually on the MRA. 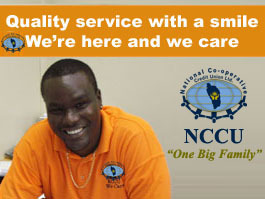 NCCU members can open MRA accounts up until the day of their fiftieth birthday. Visit any of our seven (7) Branches with your birth certificate and complete an MRA application form. Click here to view the MRA application. Consider a payroll deduction or standing order for regular deposits to your MRA. To open from overseas, simply print the application form (see above) and complete. The form is to be notarised and sent to an NCCU Branch along with notarised copies of your birth certificate (or other documents which confirms your date of birth). Include a deposit or instructions to transfer from your savings account. The MRA is not a life insurance policy. It does not require members to save regularly and will not lapse. Deposit up to $1000 monthly. Save regularly through a payroll deduction. Start as soon as you begin working and any time after, up to your fiftieth (50th) birthday. Withdrawals are not encouraged because the account is designed to provide you with income after retirement. The MRA can be pledged as collateral against a loan at NCCU or elsewhere, to the extent of the cash value at the date of pledging. Members can save in an MRA up to age 60. The account can, however, be closed anytime after age 55 without any interest penalty. You must be an account holder for a minimum of five years and reach the age of 55 to receive the special premium interest rate and the full value of the MRA. Any remaining balance at the date of member's death will be paid to his/her beneficiary or estate upon presentation of proper documentation. See below how much you can set aside by starting to save early for your retirement. Columns A assumes $50, Columns B $100 and Columns C $200 contributed monthly at a rate of 4% per annum. For illustrative purposes only. Actual balances may vary. Note: All members with MRAs can keep the account open till age 60. Members have the option, however, to close the account anytime after age 55 without any interest penalty.